You wish to advise your client but use the services of Brightstar to manage the process with the lender on your behalf. The complexities and time-consuming nature of high value mortgages often mean that a one-size-fits-all approach doesn’t work in your clients’ best interests. It could be that you’re dealing with complex incomes, non-standard property types, foreign nationals, or higher income multiples. Take a weight off your mind with Private Label. Our exclusive service offers an experience completely tailored to your client’s needs. Our experts know their sectors in depth and whether you want to refer your case to us and still recieve commission or remain your client’s primary contact with support from us, we’ve got you covered. We’ll find a solution that suits you and your client. With access to specialist lenders, private banks and harder to access funding lines that aren’t available on a direct-to-broker-basis, you can relax, sure in the knowledge that you’re giving your client the best possible chance of securing a mortgage deal. 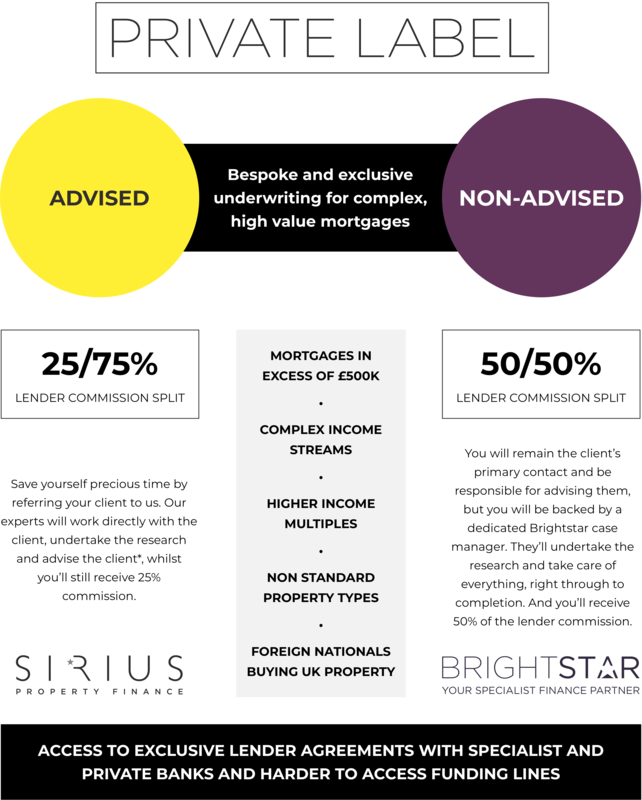 Our multi-award winning case managers at Brightstar and, advisers at Sirius, know their sector intimately and will help find a bespoke solution for your client. And we’ve partnered with dedicated, specialist underwriters at each of our lender partners who can offer tailored and exclusive underwriting for complex, high value mortgages. *All referrals will be managed by Sirius Property Finance who are adept at dealing with high net worth clients and large mortgages. Great company, and excellent people and service. Stewart, Katy and Georgia were absolutely brilliant and got us a fantastic deal very quickly with minimal fuss and they made the whole process very smooth. I would highly recommend Brightstar Financial to anyone looking for a second mortgage or secured loan. Couldn’t have got a better company to find the perfect mortgage for me. I struggled with high street banks but these people managed to pull it off with ease. Literally they could not do enough and was there for me from start to finish and made what seemed the impossible, possible. I’m now the proud owner of a home not just a house and would recommend them to anyone. Big thank you to Gina and Kevin ask for one of these and they go over and above to get what you need, whatever your circumstance. My experience with Brightstar Financial has been extremely positive, and I would highly recommend the company to anyone seeking specialist financial products. They really are an innovative, proactive, responsible partner who will seek to responsibly achieve the best financial product from an equally responsible lender. Thank you to all at Brightstar for what you have done for us. You really have made our year for us, and you know what I mean by that. Excellent, fast, efficient service from start to finish when we applied for a second charge mortgage, as our main high street bank wouldn’t lend us anymore against our property, despite having over 100k equity in the house still. Brightstar found us a mortgage deal with Precise Mortgages on a five-year fixed rate for us to consolidate our credit card debts, so this worked out great for us and we cleared everything we owed with a lower monthly repayment. I would highly recommend there services if your bank won’t help you out anymore. Our second charge mortgage was finalised within 16 days of our initial conversation with the broker. They kept us up to date at every stage and were on the ball whenever we returned required documents and explained everything clearly. I was expecting the process to take a month or so, so was amazed when two weeks later I received the call to say everything had completed. Great work! Thoroughly recommend. Really nice company to do business with. They kept me up to date at every stage of my mortgage application through to completion. Nice and smooth with no hiccups along the way. Very fast service for my remortgage. Would recommend them anytime. Kit and Shelley were very professional, patient and courteous throughout my application for a bridging loan. They presented various options, making helpful suggestions and providing useful guidance at each stage. They helped negotiate very good rates on both the loan terms and other charges (valuation, solicitor etc). I have had about 6 bridging loans in the past through other brokers and this was the easiest process by far, as well as the least expensive. I wouldn’t waste time calling anyone else the next time I need a bridging loan.